Last night I was working on a walnut dulcimer with a butternut top and snakewood (sometimes referred to as lacewood) binding around the top and back. Pictured is my immaculately clean and well-organized bench with said dulcimer after having the peghead joint to the fretboard cleaned up. This began by using a paring chisel with a very low-angle bevel. This chisel lets me take very fine and precise shavings. I was fortunate to find several vintage paring chisels of different widths at an antique mall several years ago and they are perfect for shaping braces, fitting joints cleaning up the rabbets for binding, and much more. After getting the joint very close to flush with the chisel I switch to the file hiding behind some bent binding. Like many modern files this one is not dead flat but I am familiar with its unique quirks. Most of the tools I love to use have unique quirks. Most of the people I love have unique quirks too. Also in the photograph is the template I use for laying out the rough shape of the peghead. I trace the basic shape on the stock but always end up fiddling with the exact shape and proportions by eye. 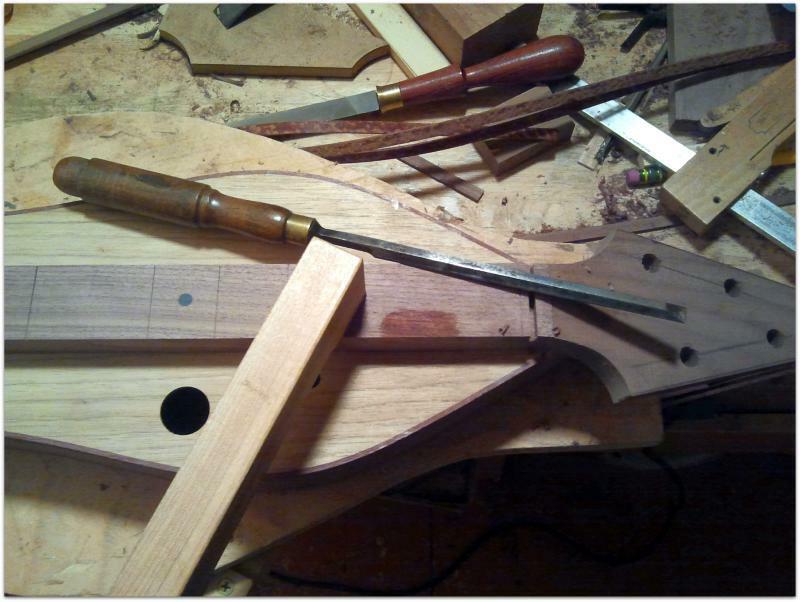 It takes more time to do this than it would to use an identical peghead on every dulcimer but I enjoy the process. It also contributes to each dulcimer being somewhat unique.